Although most people ask about what camera gear I use, I do get e-mails from people wanting to find out the particulars of the lighting setup for photos that I post on watch boards. It feels a little bit funny to write a tutorial type of post because I'm just a photography enthusiast and by no means a professional. But I'm happy to share what I've found after quite a bit of experimenting. The lighting setup to use will vary largely depending on the result that you're after for a particular photo. And it also depends on the type of wristwatch that you're going to photograph. Stainless steel watches are of course very reflective and besides reflecting objects in the room, such watches also reflect the light. That can cause very distracting so called bright spots or hot spots. 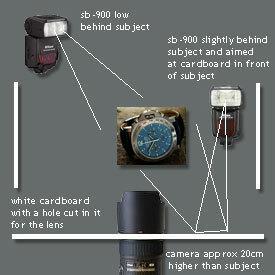 A setup with low power flash and either diffused or bounced light will get you better results for such a watch. PVD or ceramic watches however require much more light or there will be hardly any detail visible in the dark cases of such watches. Titanium watches are quite easy to photograph. No reflections in the case and not too dark. And so the lighting setup for this picture of the titanium PAM326 Luminor Chrono Daylight was actually really simple and a good starting point for an explanation about a lighting setup. I made the diagram below to show how I took the above picture. Note that the watch in this photo was placed on a piece of stone but I used a small piece of cloth underneath the case to prevent scratches. Because of the camera angle (approx. 20cm above the watch and pointing down) you don't see this in the photo. As shown in the diagram I positioned one speedlight low and behind the watch on the left of the camera to light the watch from behind and to bring out the structure of the stone underground. I placed a second speedlight at about the same height of the watch and slightly behind it, on the right of the camera. This second speedlight was used to light the dial and crystal of the watch with bounced light. I cut a hole in a large piece of white glossy cardboard. The watch was positioned in such a manner that the white cardboard was reflecting in the crystal. The light from the second flash was bounced of the cardboard onto the crystal. There was no need to shoot the speedlights through a diffuser. Two more pieces of white cardboard were placed on the left and on the right of the watch but I probably could have done without those for this particular photo. The camera (Nikon D700 + Nikkor 105mm VR) was set at manual and I used an SU-800 to remotely configure and trigger the speedlights. 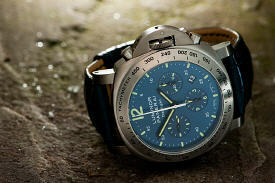 The speedlight behind the watch was fired with a power output setting at 2/3 and the second one at 1/2 power. Most of what I've learned about off-camera flash photography can be found on strobist.com. This "how-to" is also available in a slightly different version in the archives of paneristi.com. Please leave a comment if you have questions or if you find this information useful. This is very useful information, thanks for sharing! !